Mississippi continues to celebrate the holidays in true Southern style. There's not much need for hot cocoa or evenings spent by the fireside, but what you will find is the unmistakenly warm Christmas spirit of the Magnolia State. 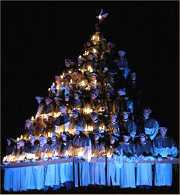 • One of the most popular Christmas events in the Southeast happens in Jackson, MS where the Singing Christmas Tree draws thousands to Belhaven University to hear an all-female choir on a tiered stage perform popular holiday hymns and carols. • For Mississippians on the Gulf Coast there's nothing like shrimp and grits to celebrate Christmas Eve. For Cajun Mississipians, it's heaping servings of gumbo that kick off the night before Christmas. The following week, it's black-eyed peas that are served on New Year's Eve to bring good luck for the coming year. • Mississipians don't buy trees in tree lots, where shelf life is short for Christmas trees grown in the state. Instead, each year most families make a day of visiting Mississippi choose-and-cut Christmas tree farms where the most popular species include the Virginia Pine, Leyland Cypress, and Eastern Redcedar. Christmas in Jackson - Check out the entire schedule of December holiday events around the capital city including contact info for Christmas at the Governor's Mansion and Candlelight Tour, the Festival of Trees, Nutcracker performances, craft demonstrations, Santa sightings and other top holiday attractions. Biloxi Christmas on the Water Boat Parade - This is Biloxi's big holiday extravaganza with more information about other Christmas events scheduled this year throughout the Mississippi Gulf Coast. Christmas by the River - Watch the big boat parade at Moss Point, a visit by Santa and topped off by a spectacular fireworks display. December in Vicksburg - Check out dates for this year's Christmas Parade of floats and marching bands plus more on Victorian Christmas at Cedar Grove Mansion, the Confederate Christmas Ball, and the Old-fashioned Christmas Open House on Main Street.